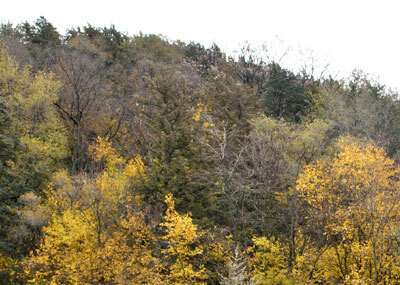 While traveling to Thomson, Illinois, a great place to catch some clean country air, get a vigorous walk in, or just catch up on some local history, is The French Bluff natural area. With it’s high bluffs, jutting plateaus and rocky shelves, this area is simply beautiful. The terrain is rough, but if you are looking for a less traveled path, this is it. The indigenous forest provides shade on warm days, and cover if you are a bird watcher. There are more than 270 species of birds along this bluff, so make sure to bring your camera. Located near Thomson, just north of Argo Fay road, this area also boasts many varieties of wildflowers from spring through the late fall. There is a small parking area for your convenience on Scenic Bluff road, just off Argo Fay Road. You can park and read about the local history of the area, or put on your hiking shoes and head up the unmarked trail to the top of the bluff and enjoy the view. The fall foliage is spectacular, as the green needles of the pine trees mix with the red, yellow and orange of the oak leaves.